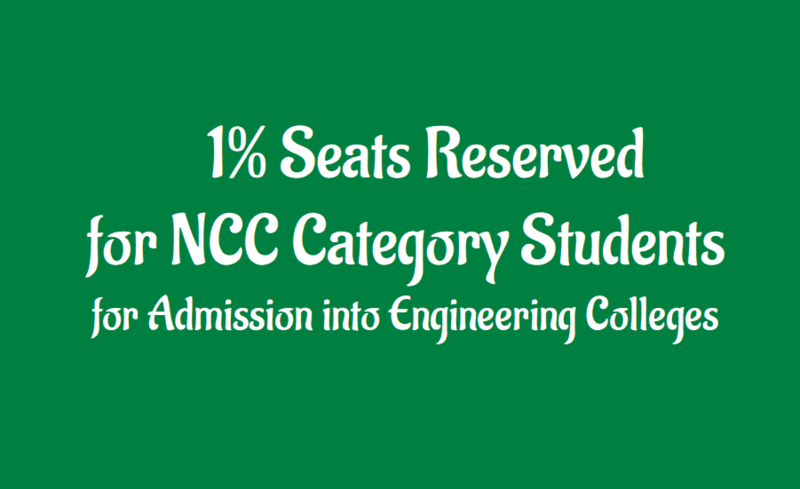 AP GO.23 One Percent/1% Seats Reserved for NCC Category for Admission into Engineering Colleges: GO.Ms.No.23; Dated: 19-06-2015: Government of Andhra Pradesh, Higher Education Department - Admission into Engineering colleges - Reservation of 1% seats under N.C.C category - Priority in respect of “other categories” under N.C.C. - orders - Issued. 3) G.O.Ms.No.155, Higher Education (EC.2) Dept., dt.17.11.2000. 4) Orders of Hon’ble High Court of Telangana and A.P. in WP No.26252/14 Dt.05.09.2014. 5) From the Dy DG NCC (AP&T), NCC Directorate, Andhra Pradesh & Telangana, Secunderabad. 6) From the CTE, AP, Letter NO.H/1551/2015, Dt.4.6.2015. (a) NCC Cadets participating at International level selected for the Youth Exchange Programme. (b) NCC Cadets Participating at International Level Events in Shooting / Sailing / Rafting / Canoeing & Kayaking / Mountaineering / Skydiving / Para jumps / Para sailing / Equestrian. (c) NCC Cadets the winners of Gallantry / National Bravery Awards / Raksha Mantri Padak. (Priority within selected cadets will be given in order of seniority of certificates i.e., C, B and A certificate holders). d) NCC Cadets participating at Republic Day Camp at New Delhi. e) Participants in All India TSC/NSC/VSC. (f) Participants of Para Jumps / Skydiving / Mountaineering / Sailing / Para Sailing / Rafting / Canoeing & Kayaking / Shooting Competitions / Equestrian conducted by the respective Federations / Associations at National Level / NCC Games at National Level. (g) National Integration Camp at Andaman & Nicobar Islands, Leh, NER and Srinagar. (a) Participants at Republic Day Parade at State Level. (c) C, B and A certificate holders. 1. Priority will be considered in C, B & A certificates attained prior to appearing in qualifying examination i.e. EAMCET / Common Entrance Test. 2. The NCC Directorate, Andhra Pradesh & Telangana shall be responsible to draw the merit list in respect of NCC cadets seeking admission under NCC quota for all candidates. 3. In case of a tie, EAMCET / CET merit will be the deciding factor for position in the merit list under NCC category. 4. Only NCC certificates issued by NCC authorities shall be valid. Priority should be considered for 'C' Certificates provided that it is obtained prior to the qualifying examination, WHICH IS INTERMEDIATE EXAMINATION. EAMCET should not be considered as the qualifying exam as it is just an entrance exam. Moreover, to appear in Eamcet you will have to qualify in Intermediate exam and get a minimum of 50% marks to be eligible for mbbs admissions. There are instances presently of students doing BSc Degree after intermediate, getting an NCC C Certificate during this course and reappearing for Eamcet with the C Certificate obtained during BSc degree which is definitely considered invalid, amounting to cheating legally. This will avoid any litigation on this issue and thereby prolonging the admissions. The decision by the Honorable court to weed out Guest candidates in the RDC Selection process for entry into Professional colleges is a welcome step for the real hard working candidates who get sidelined by the Guest candidates. Great decision for Merit and Hard work.